The head of the state academic Symphony orchestra explains where did Symphony orchestras, how they have changed over time and changed classical music. Since ancient times people knew about the impact of musical instruments on the human mood: quiet but melodious play harp, lyre, cithara, kamancha or flute made of reed, awakened the feelings of joy, love and peace, and the sound of the horns of animals (for example, the Hebrew Safarov) or metal pipes contributed to a solemn and religious feelings. Drums and other percussion, added to the horns and pipes, helping to cope with fear and woke aggressiveness and militancy. It has long been observed that cooperative play several similar instruments enhances not only the brightness of the sound, but the psychological impact on the listener — the same effect that occurs when the joint singing the same tune a large number of people. Therefore, everywhere where people settled, began to arise and unite the musicians that accompanied her battle public or ceremonial event: the rituals in the temple, marriages, burials, coronations, military parades, entertainments in the palaces. The first written mention of such associations can be found in the five books of Moses and in the Psalms of David: in the beginning of some of the Psalms there is an appeal to the head of the choir with an explanation, which instruments should be accompanied of a text. Was your group of musicians in Mesopotamia and the Egyptian pharaohs, in Ancient China and India, Greece and Rome. In the ancient Greek tradition of the execution of the tragedies there was a special platform, on which sat the musicians, accompanied by playing the instruments the performances of actors and dancers. Called the-the elevation of “the orchestra”. So the patent for the invention of the word “orchestra” is for the ancient Greeks, though the actual orchestras already existed much earlier. 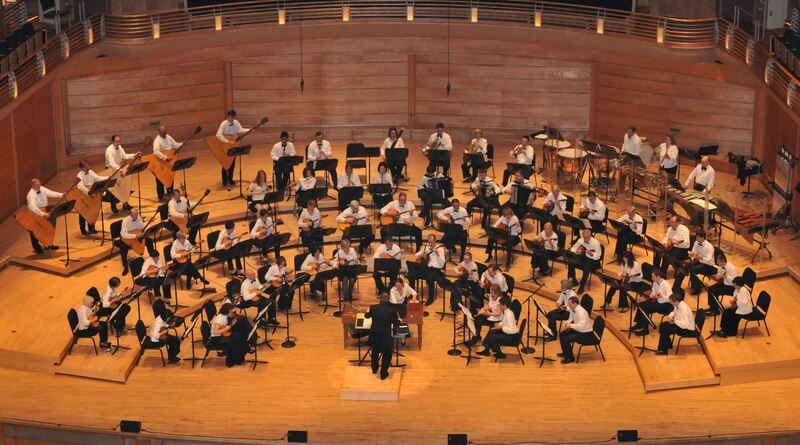 In Western culture the Association of musicians of the orchestra became known not at once. At the beginning, in the Middle ages and the Renaissance, it was called a chapel. This name was associated with belonging to a particular place, where the music performed was. Such chapel was the first Church, and then and court. And there was the village and the chapel, consisting of music-lovers. The Capella was almost a mass phenomenon. Although the level of village musicians and their instruments could not be compared with professional courtiers and temple chapels, one should not underestimate the influence of rural and later urban folk instrumental music of the great composers and European music culture as a whole. Music by Haydn, Beethoven, Schubert, Weber, Liszt, Tchaikovsky, Bruckner, Mahler, Bartok, Stravinsky, Ravel, Ligeti literally fertilized the tradition of folk instrumental music. As well as in more ancient cultures in Europe, there existed the primordial separation of music vocal and instrumental. Since the early middle Ages ruled Supreme over all the Christian Church and instrumental music in the Church developed as a support, the support of the gospel word, which has always predominated — it is “in the beginning was the Word.” Therefore, early chapel is and the people who sing and people who accompany the singing. At some point there is the word “orchestra”. Although not everywhere at the same time. In Germany, for example, the word established itself much later than in Latin countries. In Italy, the orchestra has always meant instrumental, not the vocal part of the music. The word orchestra was borrowed directly from the Greek tradition. Italian bands emerged at the turn of XVI–XVII centuries, with the emergence of the genre of Opera. And because of the extraordinary popularity of this genre, the word is quickly conquered the world. Thus, it is possible to tell with confidence that modern orchestral music two sources: the temple and the theatre. And in Germany for a long time kept a medieval-Renaissance, the name “chapel.” Until the twentieth century a German court orchestras were called chapels. One of the existing oldest orchestras in the world — Saxon state (and in the past — the Saxon court) chapel in Dresden. Its history spans over 400 years. She appeared at the court of the electors of Saxony, who always appreciated beautiful and ahead in this respect of all their neighbors. Still exist and the Berlin of the Weimar Staatskapelle, as well as Over the famous court orchestra, which Richard Strauss began as Kapellmeister (conductor current). By the way, the German word “Kapellmeister” (master of the chapel) is today still sometimes used by musicians as equivalent to the word “conductor”, but more in an ironic, sometimes even a negative sense (in the sense of craftsman, not an artist). And in those days the word was uttered with respect, as the comprehensive name of profession: “the choir Director or the orchestra who also composes music”. However, some orchestras in Germany the word is preserved as the position designation — for example, in the orchestra of the Leipzig “Gewandhaus” conductor is still referred to as “Gewandhaus-Kapellmeister”.